"Yes!!! Everyone loved them and asked me where I got them!! They were beautiful and delicious! Thank you again Nicole!!" "Everyone RAVED about the cupcakes. They were awesome!!! A few moms at the party asked about the cupcakes and I emailed them your website info. I love spreading the word when the product and service is so amazing. Can't wait for the next opportunity to order from you again!" "Nicole, Many thanks for such a beautiful and amazing cake & cupcakes!!! Omg, Im not a vanilla person but I had never tasted such amazing vanilla cupcake and the chocolate exquisite. Your the bomb! At 1am last night me and my husband were so tempted to cut a piece of the cake lol can't wait for dinner tonight!" "Nicole, Thank you so much for the beautiful and yummy cake pops you made for my daughter's shower. Everyone thought they were wonderful." "Hi Nicole... They (cake pops) were amazing!!! Thank you so much I will definitely be ordering from you again!" "Nicole designed and decorated the perfect cake for a New Year Eve celebration we held for my mothers 80th birthday. The cake was not only beautiful but tasted delicious! It was the talk of the party. Only regret was we did not order a bigger size because it was all gone in no time. Nicole made the process of ordering very simple and gave me a clear idea of her suggestions. She delivered the cake and helped to set it up. 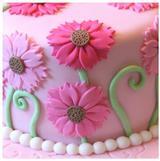 I will use her services again and would definitely recommend her cakes." "Nicole's cake pops did not disappoint...we chose the cookies and cream flavor decorated in a pink and purple "princess" theme to hand out as party favors for my daughter's 5th birthday party. Each cake pop was meticulously deorated with a variety of swirls and sprinkles, then individually wrapped and tied with a ribbon. Nicole delivered them to my home the day before the party sweetly displayed in an elegant, white, ceramic flower pot. Her attention to detail was outstanding and the cake pops were not only beautiful but delicious! I highly recommend her. Looking forward to calling upon her for future events. Thanks for the wonderful treats!" "I could not be more pleased with our cake. I wanted it perfect for my baby's 1st b-day, and IT WAS! What a beautiful piece of work, everyone at the party had something to say, before and after they ate :) besides all, excelent service, thanks Nicole!" "Nicole made a cake for my daughter's christening. You can see it on her website, brown cake with flowers and a bear on it. It was more beautiful than i could have imagined and absolutely delish! In fact it was so good, I became a return customer for her first birthday! Lovely chocolate cake! Thank you Nicole!!!!!!!" "We hired Sugarbabies-cakes for my sister' baby shower. The cake was beyond delicious. Nicole did a wonderful job decorating it. She can customized any theme. If you are looking for a unique and delicious gourmet bakery, Nicole at Sugar Babies is the best choice". "My Grandson totally LOVED his Cars 2 birthday cake! Though his little brother wanted to eat the cars, he said he would keep them FOREVER! It made his birthday really, really special! Thank you! Ps. I'll be looking for MY Birthday Cake soon!" "The website is beautiful and professional! Its so easy to use and has all the info you need. Its really great! Well done Nicole, congrats! And we already know they not only look yummy but they are delicious!" "Congratulations Nicole, great news, you will do well with this, always follow your dream, and just have fun with it. It really would be interesting if you could deliver all the way to Francistown, Botswana!!! Love and Blessings to you and my bro and the boys!!!" "Wow! Your cakes are as beautiful as you are. You are an inspiration. My hat is off to anyone who can start a business with three small children at home! Churchill loves the race car birthday cake and Skye loves the seashell cake." Nicole met and exceeded our expectations with the fabulous cakes she made for our two year old son’s birthday parties ... she is a true artist with remarkable attention to detail ... we would wholeheartedly recommend her to anyone who needs a custom cake made. The Belle cake Nicole created was absolutely beautiful! Not only was the cake beautiful but it tasted AMAZING! Everyone at our party wanted her information and have ordered cakes from her .Her creations are the best ! I highly recommend her! Nicole has baked for several of our family events - baptisms, birthdays and anniversaries. Her cakes are always a big highlight of the party baptisms, birthdays and anniversaries. Her cakes are always a big highlight of the party - beautifully decorated and delicious! She always takes my vague ideas, and somehow turns it into exactly what I want! We highly recommend SugarBabies for competitive pricing and excellent cakes! I was very scared with actually finding a baker online. I couldn't be HAPPIER with Nicole and her beautiful creation that she created for our sons first birthday. The cake was nothing short of pure perfection. The details and every single ounce of patience and care that she put into this cake and cupcakes made my baby's first birthday a for sure HIT. I emailed her the photo of the decorations and colors that I chose to use and she worked her magic and matched everything PERFECTLY!! Let's not mention not only were they cute to look at, the cake and cupcakes were absolutely delicious. Moist, fresh and totally scrumptious. I can't thank her enough! This is my second year working with Nicole and her cakes are amazing! Always the hit of the party! She is so easy to work with, offers great ideas and the end result is fabulous! Did Winnie the Pooh one year. The tiny details down to each and every leaf on the tree were great. The Minion cake - every hair on his head was flawless and the tiny detail of his pocket being open just shows how much thought she puts into each cake. The cake itself - moist and delicious. Nicole did an amazing job on the cake for my sister-in- law's baby shower. She had a Baby Bunny theme and Nicole not only perfected the concept the mommy-to-be had in mind, but the cake was delicious! Plus she delivered it to the location of the party so it was very hassle-free. I was very impressed! Your work is beautiful!! We sent you an email for a price quote for a cake and cupcakes for a baby shower in a couple weeks earlier today and look forward to hearing from you!!! Nicole's cake was a hit at my son's 5th birthday party. Not only did the cake look amazing but it was moist and so delicious too. You can tell that she takes pride in her work. I would highly recommend Nicole's cakes for any occasion. Nicole did a wonderful job, from initial communication/concept until final delivery! The cupcakes came out BEAUTIFUL! And they were super tasty. Thank you again! Our rock 'n roll cake and coordinating cupcakes looked and tasted amazing. Working with Nicole was a pleasure! The cupcakes and cake from SugarBabies were a huge hit at the co-Ed Baby Shower I threw for my daughter and son-in-law. Nicole took my sketchy suggestions and turned them into a work of art. Visually appealing, and delicious too! Everyone wanted to know "Who made dessert?" I'll be using SugarBabies again for sure! Nicole made the most amazing cake for my son's bowling themed birthday party. The guests were amazed and the cake and accompanying cupcakes were delicious. Thanks Nicole for the amazing creations! We will be ordering again for future events! Your work is beautiful !! I cannot wait to see my daughters cake from you!!! You are so so talented!!!! I ordered a cake for my nieces Sweet 16 with a Mardi Gras theme and words can not begin to describe what an AMAZING piece of art it was. The details were beautiful! The cake itself was delicious! Thank You so much Nicole for the wonderful job you did. Your work is flawless. I look forward to contacting you again for more birthdays. Once again THANK YOU! I ordered cupcakes and a small cake for a bridal shower and everything was AMAZING! The decorations were beautiful and the taste was even better. Everyone is still talking about how good they were and will definitely be placing orders with Sugarbabies cakes for future events! Thank you so much, Nicole! Gracias Nicole, la torta que preparaste para Sofi estuvo espectacular y deliciosa!! Tu trabajo es genial! Muchas muchas gracias! Thank you so much for an amazing baby shower cake! I couldn't have asked for anything more! Not only did it look amazing and taste amazing your customer service was the best!! I will make sure to recommend you!! Nicole made the cake for our wedding! We were very pleased with the whole process. Nicole made the ordering process very easy. She delivered and set up the cake for us. The cake was just beautiful! Very elegant looking. It was so pretty BUT the cake tasted even better than it looked!!!! Everyone was amazed at how fresh the cake was and how delicious too! We are very happy that we used Nicole/Sugar Babies for our wedding cake. It made a special day even that much more special! Thank you Nicole! We look forward to ordering from you in the future!!!! Wow you guys. Great work. All you need is TV show now. Nicole designed and decorated the perfect cake for a New Year Even celebration we held for my mothers 80th birthday. The cake was not only beautiful but tasted delicious! It was the talk of the party. Only regret was we did not order a bigger size because it was all gone in no time. Nicole made the process of ordering very simple and gave me a clear idea of her suggestions. She delivered the cake and helped to set it up. I will use her services again and would definitely recommend her cakes. Nicole! Your work blows me away - so beautiful and creative. We SOO wish we were closer. Great job - so happy for you and your business! Best of luck. I was totally blown away,very artistic and creative. beautiful and clean art work. Love it! Nicole's cake pops did not disappoint...we chose the cookies and cream flavor decorated in a pink and purple "princess" theme to hand out as party favors for my daughter's 5th birthday party. Each cake pop was meticulously decorated with a variety of swirls and sprinkles, then individually wrapped and tied with a ribbon. Nicole delivered them to my home the day before the party sweetly displayed in an elegant, white, ceramic flower pot. Her attention to detail was outstanding and the cake pops were not only beautiful but delicious! I highly recommend her. Looking forward to calling upon her for future events. Thanks for the wonderful treats! Nicole made a cake for my daughter's christening. You can see it on her website, brown cake with flowers and a bear on it. It was more beautiful than i could have imagined and absolutely delish! In fact it was so good, I became a return customer for her first birthday! Lovely chocolate cake! Thank you Nicole!!!!!!! I could not be more pleased with our cake. I wanted it perfect for my baby's 1st b-day, and IT WAS! What a beautiful piece of work, everyone at the party had something to say, before and after they ate :) besides all, excellent service, thanks Nicole! Everything looks beautiful and oh so yummy! I look forward to my first taste!! We hired Sugarbabies-cakes for my sister' baby shower. The cake was beyond delicious. Nicole did a wonderful job decorating it. She can customized any theme. If you are looking for a unique and delicious gourmet bakery, Nicole at Sugar Babies is the best choice. I had the cake pops for the first time on Thanksgiving. They were amazing. How do you stay so skinny Nicole? Definitely not just any cake.....these are one of a kind. The site looks as good as the cakes! Nicole, of "SugarBabies Cakes & Cupcakes by Nicole", takes great pride in everything she bakes. She uses only the very finest of ingredients and never "cuts corners" where quality is concerned! Each SugarBabies Creation is personally designed & decorated with care and pride and is truly a "one of a kind"! Nicole, the heart and soul of SugarBabies, was born, and grew up, in Jamaica, West Indies. Her artistic instincts were obvious from an early age and bloomed through the years. She is also an accomplished photographer and hopes to soon include an Event Photography page in her website. Nicole holds a B.A. in Hospitality Management and has been in the industry for more than ten years. She worked in catering before taking up the post of Events Coordinator at a major Resort Hotel in Miami. With her husband Dane, Nicole had her first child in 2006 and by the time their second child was born in 2009, she had realized that her heart was at home with her own little sugar babies. It was then that Nicole conceptualized “SugarBabies”, named for her own sweet babies who now number three with the birth of her third son in June of 2011. Nicole's life-long passion for detail and her fine artistic talent shines through in every creation... whether its a Super Hero Birthday Cake or "Pretty in Pink " Princess Cupcakes... whether it is an elegantly modern Black & White Wedding Cake or whimsical Baby Shower Cake... whatever the project... Nicole will work with you to make your occasion a truly Special Occasion! Please feel free to add your own comments to our Guest Book! It's located on the home page. To go there... "click here"